For many, attention deficit disorder (ADD) and attention deficit/hyperactivity disorder (ADHD) are thought of as a disability but this certainly isn’t the case 100% of the time. Attention deficit disorders can be leveraged to your advantage with the right understanding and the use of key nootropic supplements. Nootropics are a class of supplements that work specifically towards improving brain function. There are nootropics that work on nearly every process in the brain, some of which can be directly beneficial for people suffering from ADHD. 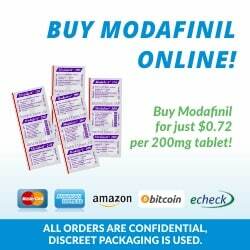 What are the best nootropics for ADD/ADHD? How can they be used to make an ADHD diagnosis an advantage rather than a disability? First of All, What is ADD/ADHD? 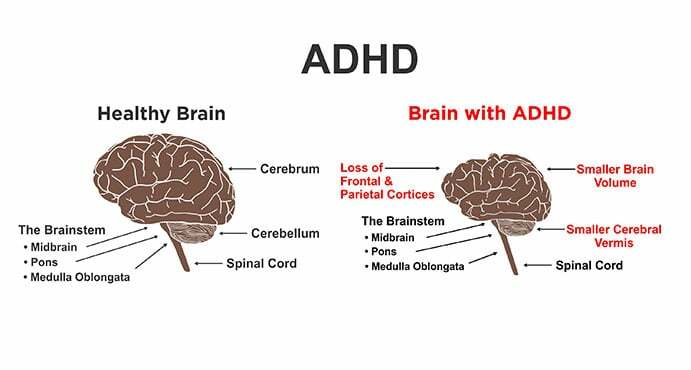 Both ADD and ADHD involve difficulty concentrating and sitting still. The main difference between the two conditions is that ADHD also involves hyperactivity, where sufferers find it very hard to settle down or relax. It’s a condition common in children but can extend into adulthood as well. There are no objective tests that can confirm or deny the presence of ADHD. The way we diagnose the condition is through assessments by a psychologist. This diagnosis is often considered to be controversial, especially by the likes of renowned Harvard psychologist, Jerome Kagan, who has called ADHD a fraud in the past. There have been some studies reporting that people with ADHD tend to have lower dopamine activity than those not considered to have ADHD.Fugate, C. M., Zentall, S. S., & Gentry, M. (2013). Creativity and working memory in gifted students with and without characteristics of attention deficit hyperactive disorder: Lifting the mask. Gifted Child Quarterly, 57(4), 234-246. This would explain many of the symptoms including difficulty concentrating, constant fidgeting, and mood swings. Whether ADHD is a medical condition or simply a character trait doesn’t really matter. The fact remains that there are a set of people out there suffering from the classic characteristics associated with ADHD. Luckily, there are ways to leverage the condition using nootropic supplementation. We can effectively turn this “disadvantage” into an advantage. There are certain traits people with ADHD have that can be of great use to them, especially if you know how to leverage it with nootropics and lifestyle habits. Learning to leverage the condition starts with identifying the positives (strengths) and negatives (weaknesses). We’ll discuss what these benefits are, how nootropics can used to leverage them, and list some of the top nootropic compounds that can help us achieve this. A recent study compared the qualities of gifted ADHD sufferers and gifted non-ADHD sufferers with equivalent fluid intelligence scores. The ADHD group had poorer memory but significantly greater creativity scores.Fugate, C. M., Zentall, S. S., & Gentry, M. (2013). Creativity and working memory in gifted students with and without characteristics of attention deficit hyperactive disorder: Lifting the mask. Gifted Child Quarterly, 57(4), 234-246. A study looking at this question gave a set of people diagnosed with ADHD, and people without ADHD a task to create a fruit that one might find on an alien planet. The non-ADHD sufferers modeled their fruits on real-world examples, while the ADHD group tended to produce examples that were much more “alien-like”. Their creations were considered more “out of the box” than the non-ADHD group on average.White, H. A. 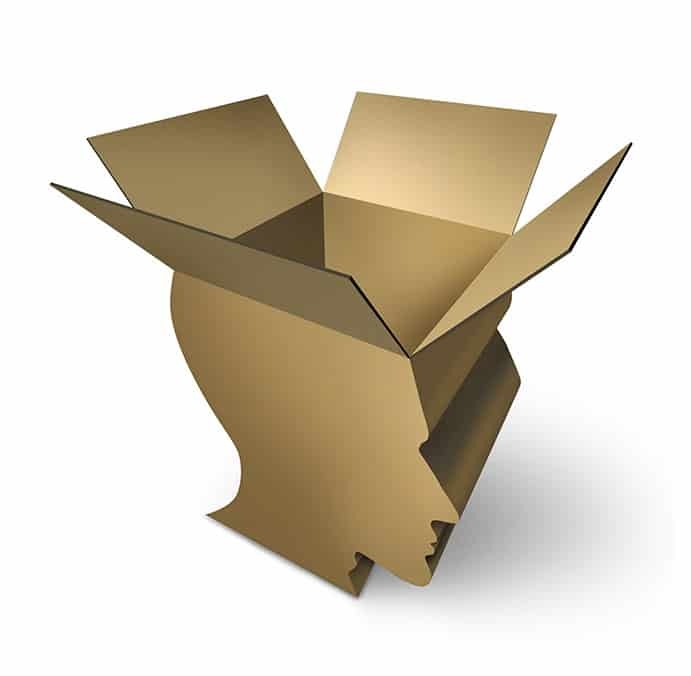 Thinking “Outside the Box”: Unconstrained Creative Generation in Adults with Attention Deficit Hyperactivity Disorder. The Journal of Creative Behavior. “This has implications for creative design and problem-solving in the real world when the goal is to create or invent something new without being overly constrained by old models or ways of doing things”. A study published in 2009 found a correlation between risk-taking and ADHD in children.Garzon, D. L., Huang, H., & Todd, R. D. (2008). Do attention-deficit/hyperactivity disorder and oppositional defiant disorder influence preschool unintentional injury risk?. Archives of psychiatric nursing, 22(5), 288-296. The same study that found ADHD sufferers had greater creativity scores also found, them to have poorer memory on average than non-ADHD sufferers.Fugate, C. M., Zentall, S. S., & Gentry, M. (2013). Creativity and working memory in gifted students with and without characteristics of attention deficit hyperactive disorder: Lifting the mask. Gifted Child Quarterly, 57(4), 234-246. This highlights an area to focus nootropic support on and there are plenty of nootropics available that can be used to support this. 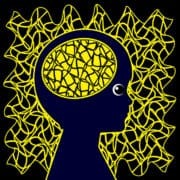 The characteristic symptom of both ADD and ADHD is difficulty concentrating. This is likely due to the fact that ADHD sufferers tend to have lower dopamine levels in the brain.Li, D., Sham, P. C., Owen, M. J., & He, L. (2006). Meta-analysis shows significant association between dopamine system genes and attention deficit hyperactivity disorder (ADHD). Human molecular genetics, 15(14), 2276-2284. Dopamine plays a key role in the reward center of the brain, used to keep us focused and on track. ADHD sufferers often have to work extra hard to stimulate the reward center, causing them to lose focus and seek other sources of stimulation. Executive functioning is the processes we use to organize, plan, and complete tasks throughout the day. People with ADHD tend to have less organized thought processes, which can negatively affect their ability to achieve their goals both on a daily basis and in the broader scope of life. So from the above, we can summarise that those with ADHD need to improve their ability to organize thoughts, reduce overstimulation, boost dopamine levels, and support the processes involved with memory. By focusing on these weaknesses, they can support their strengths of heightened creativity, original thinking, and elevated risk-taking behavior. 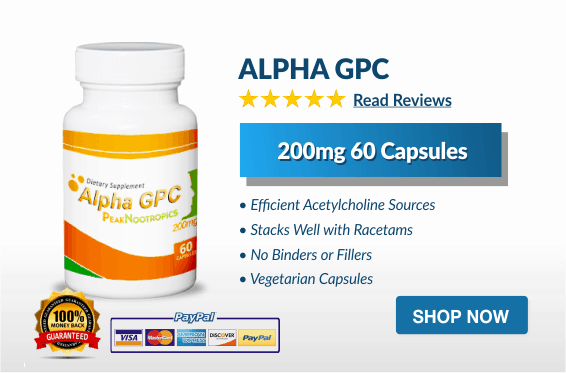 Alpha GPC is a popular nootropic supplement because of its safety and widespread benefits on the processes involved with memory. It contains a compound known as choline, which the brain uses to build the important neurotransmitter acetylcholine. Acetylcholine is one of the main neurotransmitters involved with memory.Hasselmo, M. E. (2006). The role of acetylcholine in learning and memory. Current opinion in neurobiology, 16(6), 710-715. Increasing the activity of acetylcholine also has the added benefit of increasing dopamine output,Trabucchi, M., Govoni, S., & Battaini, F. (1986). Changes in the interaction between CNS cholinergic and dopaminergic neurons induced by L-alpha-glycerylphosphorylcholine, a cholinomimetic drug. Il Farmaco; edizione scientifica, 41(4), 325-334. achieving 2 separate benefits for people with ADHD. The recommended dose for these effects is about 1200 mg per day, separated into three 400 mg doses. This is a lesser-known herbal nootropic that rising in popularity, especially among those suffering either depression or ADHD. It owes much of its nootropic benefit to its ability to increase the activity of dopamine. Many of the early studies on catuaba have looked into its ability to treat depression.Campos, M. M., Fernandes, E. S., Ferreira, J., Santos, A. R., & Calixto, J. B. (2005). Antidepressant-like effects of Trichilia catigua (Catuaba) extract: evidence for dopaminergic-mediated mechanisms. Psychopharmacology, 182(1), 45-53. These studies highlighted its ability to inhibit dopamine reuptake, which is the primary mechanism of pharmaceutical ADHD drugs such as Provigil, Adderall, and Ritalin use to treat the condition. Catuaba works on the dopamine system to boost memory and mood disorders without disrupting serotoninCampos, M. M., Fernandes, E. S., Ferreira, J., Santos, A. R., & Calixto, J. B. (2005). Antidepressant-like effects of Trichilia catigua (Catuaba) extract: evidence for dopaminergic-mediated mechanisms. Psychopharmacology, 182(1), 45-53. similar to the actions of ADHD pharmaceuticals. There are also no evidence that the herb has addictive potential. One thing that’s important to note is that there are a few different, unrelated species of plants referred to commonly as catuaba. It’s important to go with the species called Trichilia catigua in order to achieve these effects. The recommended dose of catuaba for ADHD is about 5g equivalent of the raw bark. You can find catuaba as a tincture and in capsules online. L-theanine is one of the most well-rounded nootropics available. It’s especially useful for people experiencing hyperactivity disorders such as anxiety or ADHD. It’s an amino acid isomer found in the tea plant (Camellia sinensis) with a characteristic calming effect on the mind, which many people with ADHD use to help gather and control their thoughts and dial down hyperactivity. InsomniaLyon, M. R., Kapoor, M. P., & Juneja, L. R. (2011). The effects of L-theanine (Suntheanine®) on objective sleep quality in boys with attention deficit hyperactivity disorder (ADHD): a randomized, double-blind, placebo-controlled clinical trial. Alternative medicine review, 16(4), 348. AnxietyLu, K., Gray, M. A., Oliver, C., Liley, D. T., Harrison, B. J., Bartholomeusz, C. F., … & Nathan, P. J. (2004). The acute effects of L‐theanine in comparison with alprazolam on anticipatory anxiety in humans. Human Psychopharmacology: Clinical and Experimental, 19(7), 457-465. Low dopamine activityYokogoshi, H., Mochizuki, M., & Saitoh, K. (1998). Theanine-induced reduction of brain serotonin concentration in rats. Bioscience, biotechnology, and biochemistry, 62(4), 816-817. Poor memoryPark, S. K., Jung, I. C., Lee, W. K., Lee, Y. S., Park, H. K., Go, H. J., … & Rho, S. S. (2011). A combination of green tea extract and l-theanine improves memory and attention in subjects with mild cognitive impairment: a double-blind placebo-controlled study. Journal of medicinal food, 14(4), 334-343. L-theanine has been shown to increase alpha-waves in the brain. Alpha-waves are associated with a calm, focused state of mind.Kobayashi, K., Nagato, Y., Aoi, N., Juneja, L. R., Kim, M., Yamamoto, T., & Sugimoto, S. (1998). Effects of L-theanine on the release of alpha-brain waves in human volunteers. Journal of the Agricultural Chemical Society of Japan (Japan). They’re measured on a specialized machine that scans brain activity. Most people with ADHD are reported to have theta/beta wave activity associated with disorganized, hyperstimulated states of mind.Loo, S. K., & Barkley, R. A. (2005). Clinical utility of EEG in attention deficit hyperactivity disorder. Applied neuropsychology, 12(2), 64-76. The recommended dose of l-theanine for ADHD is 500 – 750 mg per day split into two even doses. Bacopa is famous for its use in Ayurvedic medicine as a cognitive enhancer. It was used in traditional medical systems such as this for treating mental conditions including memory. Ayurveda places a strong emphasis on treating the mind because they believe if there’s a problem with the mind, it becomes difficult to connect with the spirit, which is the source of all healing. The idea is that if you heal the mind you also heal the body. This explains the abundance of nootropic herbs coming out of Ayurveda, with herbs like bacopa leading the way. More recently, bacopa has seen a surge in interest among people suffering from ADHD and ADD for its ability to alleviate the most common symptoms (poor memory, anxiety, weight loss, and insomnia). One study investigating this effect involving 31 children between the age of 6 and 12 with ADHD. A standardized extract of bacopa (225 mg per day for 6 months) was able to alleviate the symptoms by 20% in most children (74%), and between 21% and 50% in the rest (26%).Dave, U. P., Dingankar, S. R., Saxena, V. S., Joseph, J. A., Bethapudi, B., Agarwal, A., & Kudiganti, V. (2014). An open-label study to elucidate the effects of standardized Bacopa monnieri extract in the management of symptoms of attention-deficit hyperactivity disorder in children. Advances in mind-body medicine, 28(2), 10-15. ADHD doesn’t need to be considered a disability, but merely a character trait. There are clear advantages to the condition when optimized with supplements and lifestyle changes that leverage the strengths and address the negatives. Each case of ADHD is unique, so it’s best to identify these strengths and weaknesses on an individual basis and choose nootropics accordingly. Following the general guidelines above can make for an excellent starting point. 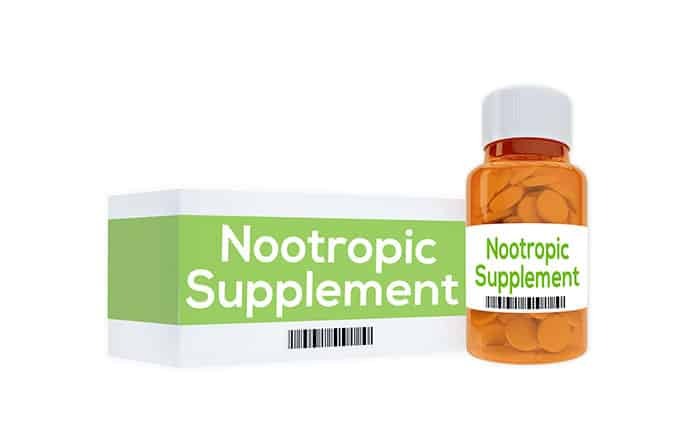 Between alpha-GPC, catuaba, l-theanine, and bacopa, there are plenty of excellent nootropic compounds that can be used alongside an ADHD diagnosis to support a successful, productive life. 1, 2, 5. ↑ Fugate, C. M., Zentall, S. S., & Gentry, M. (2013). Creativity and working memory in gifted students with and without characteristics of attention deficit hyperactive disorder: Lifting the mask. Gifted Child Quarterly, 57(4), 234-246. 3. ↑ White, H. A. Thinking “Outside the Box”: Unconstrained Creative Generation in Adults with Attention Deficit Hyperactivity Disorder. The Journal of Creative Behavior. 4. ↑ Garzon, D. L., Huang, H., & Todd, R. D. (2008). Do attention-deficit/hyperactivity disorder and oppositional defiant disorder influence preschool unintentional injury risk?. Archives of psychiatric nursing, 22(5), 288-296. 6. ↑ Li, D., Sham, P. C., Owen, M. J., & He, L. (2006). Meta-analysis shows significant association between dopamine system genes and attention deficit hyperactivity disorder (ADHD). Human molecular genetics, 15(14), 2276-2284. 7. ↑ Hasselmo, M. E. (2006). The role of acetylcholine in learning and memory. Current opinion in neurobiology, 16(6), 710-715. 8. ↑ Trabucchi, M., Govoni, S., & Battaini, F. (1986). Changes in the interaction between CNS cholinergic and dopaminergic neurons induced by L-alpha-glycerylphosphorylcholine, a cholinomimetic drug. Il Farmaco; edizione scientifica, 41(4), 325-334. 10, 11. ↑ Campos, M. M., Fernandes, E. S., Ferreira, J., Santos, A. R., & Calixto, J. B. (2005). Antidepressant-like effects of Trichilia catigua (Catuaba) extract: evidence for dopaminergic-mediated mechanisms. Psychopharmacology, 182(1), 45-53. 12. ↑ Lyon, M. R., Kapoor, M. P., & Juneja, L. R. (2011). The effects of L-theanine (Suntheanine®) on objective sleep quality in boys with attention deficit hyperactivity disorder (ADHD): a randomized, double-blind, placebo-controlled clinical trial. Alternative medicine review, 16(4), 348. 13. ↑ Lu, K., Gray, M. A., Oliver, C., Liley, D. T., Harrison, B. J., Bartholomeusz, C. F., … & Nathan, P. J. (2004). The acute effects of L‐theanine in comparison with alprazolam on anticipatory anxiety in humans. Human Psychopharmacology: Clinical and Experimental, 19(7), 457-465. 14. ↑ Yokogoshi, H., Mochizuki, M., & Saitoh, K. (1998). Theanine-induced reduction of brain serotonin concentration in rats. Bioscience, biotechnology, and biochemistry, 62(4), 816-817. 15. ↑ Park, S. K., Jung, I. C., Lee, W. K., Lee, Y. S., Park, H. K., Go, H. J., … & Rho, S. S. (2011). A combination of green tea extract and l-theanine improves memory and attention in subjects with mild cognitive impairment: a double-blind placebo-controlled study. Journal of medicinal food, 14(4), 334-343. 16. ↑ Kobayashi, K., Nagato, Y., Aoi, N., Juneja, L. R., Kim, M., Yamamoto, T., & Sugimoto, S. (1998). Effects of L-theanine on the release of alpha-brain waves in human volunteers. Journal of the Agricultural Chemical Society of Japan (Japan). 17. ↑ Loo, S. K., & Barkley, R. A. (2005). Clinical utility of EEG in attention deficit hyperactivity disorder. Applied neuropsychology, 12(2), 64-76. 18. ↑ Dave, U. P., Dingankar, S. R., Saxena, V. S., Joseph, J. A., Bethapudi, B., Agarwal, A., & Kudiganti, V. (2014). An open-label study to elucidate the effects of standardized Bacopa monnieri extract in the management of symptoms of attention-deficit hyperactivity disorder in children. Advances in mind-body medicine, 28(2), 10-15.